I am well aware of what a horrible mental image that conjures up, but these were named by a fifteen-year-old boy and that’s the kind of thing he finds hilarious. Frankly, I couldn’t argue with him – that’s exactly what they look like. Fortunately, they’re tasty enough to make up for it. I didn’t figure out the nutrition stats for these, but they should be fairly low in fat. If you replace the oil with fat-free yogurt or sour cream and leave out the chocolate chips, they could be fat-free. Combine all ingredients except chocolate chips. Stir in chips. 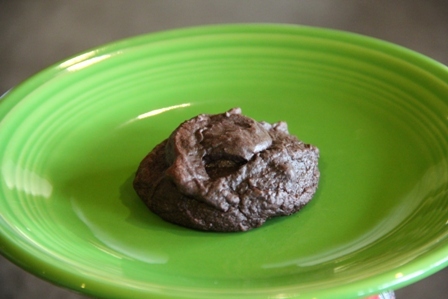 Drop by heaping tablespoons onto parchment paper on a cookie sheet. Bake at 350 degrees for 10 – 12 minutes. The cookies should be shiny on top and the edges should be slightly dull. Cool. This made about 13 large cookies for us and they were still fudgy inside. They didn’t stay around for long, but they were so much yummier than they look.